This modern, luxury detached villa has a wonderful 1100 m2 garden with a large lawn, a wooden veranda at the front of the house, garden furniture, a parasol and loungers. Guests also have the use of a permanent barbecue and a private indoor swimming pool (7 x 3.20 m) with jet stream for a delightfully sporty swim. In the same space there is also a sauna, jacuzzi and steam cabin. There is lots of space for children to play. 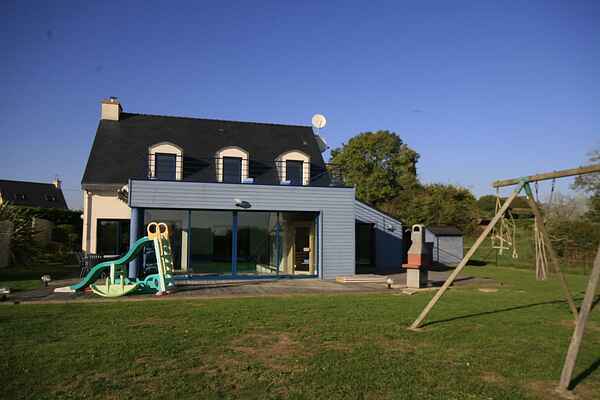 The luxury villa is just 600 metres from Trénez beach and 5 km from the small town of Moëlan-sur-Mer. This area, in the south of Finistère, boasts 14 km of varied coastline ranging from steep cliffs to small fishing ports hidden in rugged coves. You will also find various beaches in sheltered coves. There are boats and kayaks for hire in season only on the beach of Kerfany 2.5 km or in the center of Beg Porz 3.5 km. Located in the region of Finistère, which literally means 'end' (Finis) of the world (tère). The area promises a rugged and impressive piece of Brittany, known for its heathland and rock formations rising high up out of the ocean to be constantly battered by the waves.